This is my first reveal this month for 2 Crafty. I got inspired by the Prima BAP for April and a challenge at Shimmerz paint's blog. I used some 2 Crafty circles to add some layers to the background paper. I covered them with blue and green Shimmerz: Sea foam, bamboo leaf and olive branch. I let the leftover ink drip onto the page. I used the new 2 Crafty lavender shrubs to add dimension and direction to the layout. I also covered them in blue and green Shimmerz: Sea foam, bamboo leaf and olive branch. Finally I used the Dream Big title from 2 Crafty. I inked it with turquoise and green chalk ink. I tried to blend the two colors together. I complimented the colors with some coral hues from these beautiful Prima flowers. Here is my second project for my 2 Crafty reveal. 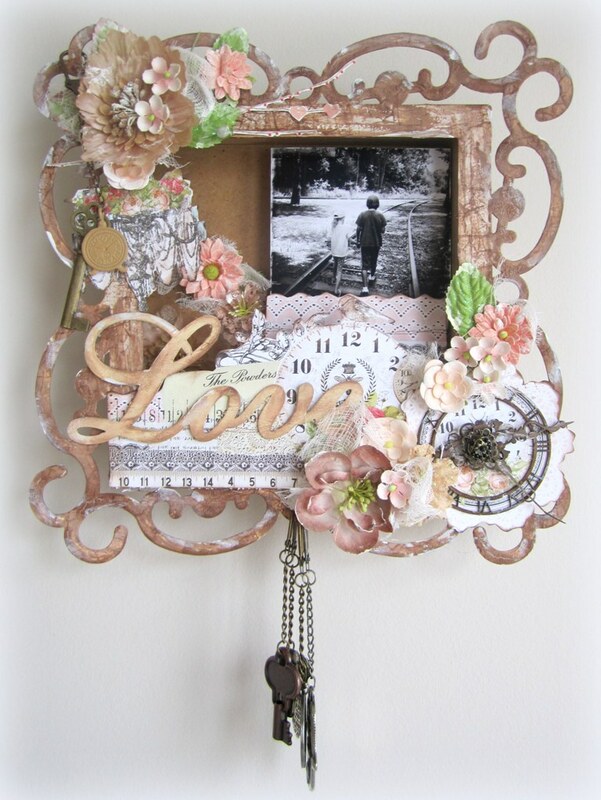 I used the 2 Crafty 11" Nella Frame for this project as well as the Love title, a clock face frame and 2 vintage clock hands. 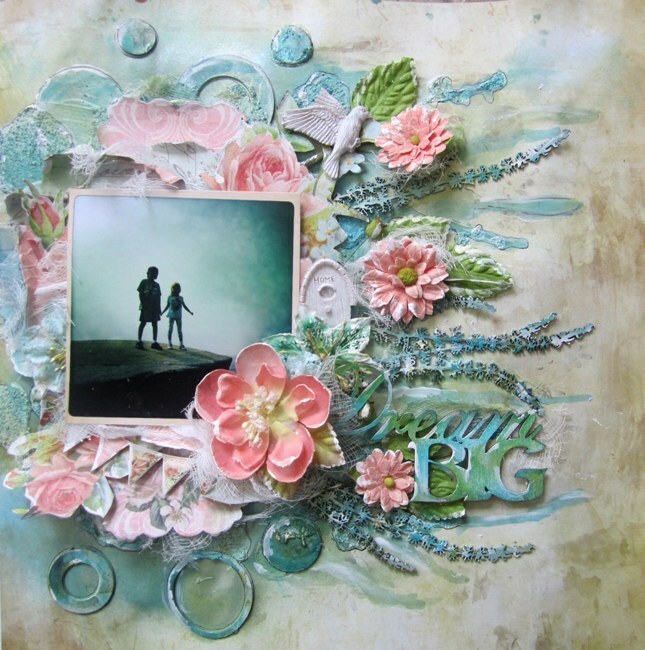 For the papers and the flowers I used Prima products. The hanging metal embellishments are a variety of products and jewelry I had in my stash. 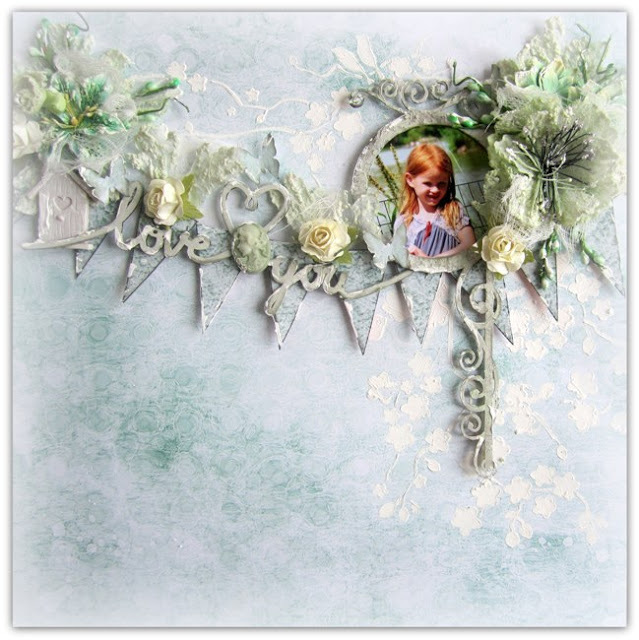 Finally I want to show you a layout I created earlier this month using a couple of 2 Crafty Chipboard pieces. So very beautiful Keren and I will definitely be back to watch the video! Wonderful creations - looks amazing! Such glorious projects - amazing work, as always, Keren - and I'm looking forward to checking out the video, very soon! Keren, you have outdone yourself and thanks for the video on the shadow box, makes it a great alternative to a photo and shows how it is not too complicated a project. Thanks for sharing. *sigh* these are all soooooooooo gorgeous!! WOW WOW WOW!!! There's a reason (well many reasons) why Keren has been one of my favorite designers for a long time now. FABULOUS artwork Keren! Absolutely amazing, and so beautiful! Oh wow these are delightful!!! Your creations are so beautiful Keren. Off to check out the video now. Thanks for showing! All these pieces are just gorgeous! Oh girls thank you so much!! you make me blush but you made my day!! Gorgeous projects Keren love the video! !